Paul O’Callaghan is the founding CEO of O2 Environmental, a leading consultancy providing expert analysis on global water technology market opportunities. 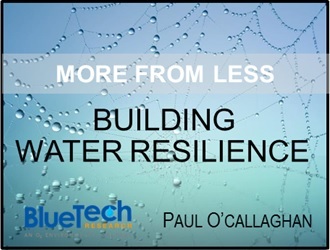 Paul also founded BlueTech® Research, a global provider of water technology market intelligence services, enabling clients to identify key opportunities and emerging trends in the global water industry. With more than 19 years of experience in the water sector, Paul is widely recognized for his expertise in market analysis and success in providing business development support to venture-backed water companies, including Ostara, SCFI, UV Sciences (now NeoTech Aqua) and Microdynamics UV. Paul holds a B.Sc. in Biochemistry and a Masters Degree in Water Resource Management. He has authored and presented numerous papers on emerging water and wastewater treatment technologies, guest lectured at Harvard Business School, provided commentary on the Discovery Channel, and delivered keynotes at numerous international events including the Singapore International Water Week TechXchange Workshop. Among Paul’s more recent accomplishments is the establishment of the annual Innovation Showcase at WEFTEC in collaboration with the Water Environment Federation (WEF) and Imagine H2O.